The Sportscar Vintage Racing Association (SVRA) announced today that Ultimate Headers, a leading manufacturer of aircraft quality performance automobile headers, has joined the fold of sponsors lining up with America’s premier vintage racing organizations. The Ultimate Headers announcement builds on the string of SVRA sponsorship agreements over the past year. Top-brand SVRA investors include Merrill-Lynch, Jaguar, Land Rover, NetJets, Mazda and Bell Helmets. SVRA’s success in attracting sponsorship is a cornerstone to the company’s impressive momentum. Company officials report consistent annual triple-digit growth since 2012. SVRA has rapidly expanded from a regional series largely concentrated in the southeastern United States to one that spans the continent at most of America’s top race courses. 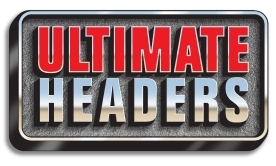 About Ultimate Headers – Ultimate Headers is headquartered in Berea, Ohio and brings innovative headers to the automotive performance market. Jim Browning, the founder and past president of Corsa Performance, leads the company and describes his state-of-the-art headers as “engineered muscular elegance.” Ultimate Headers uses leading edge engineering, computer-aided design and manufacturing, as well as aircraft grade materials to deliver an advanced perspective in terms of appearance, design, and functionality. In addition to headers, the company provides investment cast header flanges, investment cast tight-radius elbows, collector flanges and tubing across more than 80 applications. All are constructed of 321 stainless steel, a material known for the highest possible resistance to corrosion and excessive heat. 321 is used in Formula One, NASCAR, and IndyCar, as well as in applications such as aircraft exhaust manifolds, furnace parts, and heat exchangers.